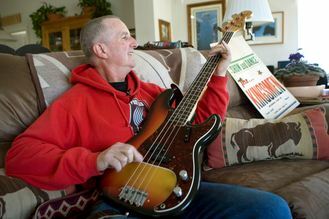 PORTLAND, Ore. — When he stood on his toes, leaned his head back and began to incoherently shout "Louie Louie" into a microphone 52 years ago, Jack Ely had no idea he was creating a rock 'n' roll classic. Or, for that matter, did the lead singer of The Kingsmen know he was laying the groundwork for one of the first federal investigations into dirty song lyrics, while simultaneously creating a tune so memorable that everybody from the Beach Boys to Nirvana would later record it. Ely, who died Tuesday at age 71, had simply walked into a tiny Portland recording studio with his band one day in 1963 to cut an instrumental version of a song that had been a hit on Pacific Northwest jukeboxes — one that kids could dance to. "Right out of his mouth, my father would say, 'We were initially just going to record the song as an instrumental, and at the last minute I decided I'd sing it," Ely's son, Sean Ely, told The Associated Press on Tuesday. When it came time to do that, however, Ely discovered the sound engineer had raised the studio's only microphone several feet above his head. Then he placed Ely in the middle of his fellow musicians, all in an effort to create a better "live feel" for the recording. The result, Ely would say over the years, was that he had to stand on his toes, lean his head back and shout as loudly as he could just to be heard over the drums and guitars. It might not have helped, either, that the 20-year-old musician was wearing braces at the time, although Ely maintained that the real problem was trying to sing with his head tilted back at a 45-degree angle. In any case, the end result was that about the only words anyone could clearly understand were contained in the song's first two lines: "Louie Louie. Oh no. We gotta go." But the driving, three-chord instrumental progression was maddeningly memorable, as were the song's opening lines, delivered with just the right amount of rebellious if slurry snarl. It didn't hurt either that with people unable to understand what Ely was singing, some began to claim they were hearing lewd words about a girl the singer was to meet up with. Radio stations began to ban "Louie Louie," and the FBI launched an investigation, eventually determining the song was "unintelligible at any speed." Sean Ely said his father got "quite the kick" out of that latter development. Meanwhile, everyone from the Clash, to Ike and Tina Turner began covering the song. Rhino Records released not one but two albums of cover versions, including one by The Rice University Marching Owl Band. "First and foremost, it's a real easy song to play. Second, it's got a great beat. Third, it's got a lot of notoriety, meaning it must be naughty, so it must be fun," said Eric Predoehl, who is producing a documentary on the song's history called "The Meaning of Louie." He counts at least 1,700 cover versions, including numerous ones by garage bands. Frank Zappa even did one with shock jock Howard Stern. The song, written and originally recorded by the late Los Angeles R&B musician Richard Berry, contained more of a calypso beat when it was first released. It would be recorded by others, most notably the Pacific Northwest group Rockin Robin Roberts and the Wailers, before Ely and his group discovered it. The Kingsmen would follow it with a couple of other minor hits, "Money" and "The Jolly Green Giant," but nothing that compared with "Louie Louie." As for Ely, he left The Kingsmen in a dispute with other band members shortly after recording "Louie Louie." He later trained horses in Central Oregon and, according to his son, was content with his legacy as a one-hit wonder — a massive one-hit wonder, to be precise. "He wanted to try on different occasions to pursue other endeavors in the music industry, but I think when it was all done and said he was pretty happy that he did 'Louie Louie.'" Steve Aoki is the first judge to be confirmed for 'Ultimate DJ'. 'Louie Louie' singer Jack Ely dies in Oregon at 71. Sir Mick Jagger has made a touching tribute to his late girlfriend, L’Wren Scott, on what would have been her 50th birthday. Glastonbury bans nitrous oxide from this summer's festivities. Representatives for Joni Mitchell last night denied reports that the singer-songwriter had slipped into a coma. Alice Cooper's new album to feature Johnny Depp and Macca. AC/DC will use Welsh drummer Chris Slade for their upcoming Rock Or Bust album tour, but haven’t said if that is a long-term arrangement. The Thinking Out Loud star, 24, who is currently on a world tour, already claimed the record as the most-streamed Spotify artist of 2014. Sam Smith "would chop off his toe" to be able to live like a "hobbit" in Hobbiton. Multiple Grammy and Brit winner Sam Smith is up for just one award at next month’s event, which celebrates excellence in songwriting and composing.